It is the purpose of this article to describe a small caloric or hot-air engine, which may be used to drive a dynamo, small lathe, sewing machine, or for any similar purpose not requiring more than one-eighth horsepower. As such engines are not in very common use a few words as to their efficiency, their limitations, and the general principles upon which they operate, may be in order. A hot-air engine is much less efficient as a producer of power thau a gas engine, and must be several times larger to produce the same amount of power. It will compare fairly well with a small steam engine in power produced for a given amount of fuel, but has the advantage of great simplicity and few moving parts. There are no valves, ignition devices, batteries, etc., and no boiler, gauges, pumps, etc., to look after, and nothing which could possibly cause danger. Such an engine is not, however, adapted to any use requiring great power, or absolute steadiness under variations of load. It is well known that all substances expand more or less when heated, and contract again when cooled. Air can be expanded to many times its original volume if slightly heated. This fact is made useful in the caloric engine. A small quantity of air, confined in an iron cylinder, is quickly heated, and as it expands is made to push a piston in a connected cylinder. The same air is then cooled, and allows the piston to return, the process being then repeated. This alternate heating and cooling may be accomplished 100 to 150 times per minute, giving as many revolutions of the engine. The way in which this is done may be understood by reference to Fig. 1. The larger cylinder, shown in section at the top, is for heating and cooling the air. All but the middle portion of this cylinder is deeply threaded to give greater radiating and heat absorbing surface. The left hand end is enclosed in a fire-box (not shown) and a suitable burner placed beneath. A gas, oil, or alcohol burner may be used. The right hand end is for cooling, and may be provided with a small fan-wheel driven by the engine to increase the air circulation, and thus cool the air inside more quickly. 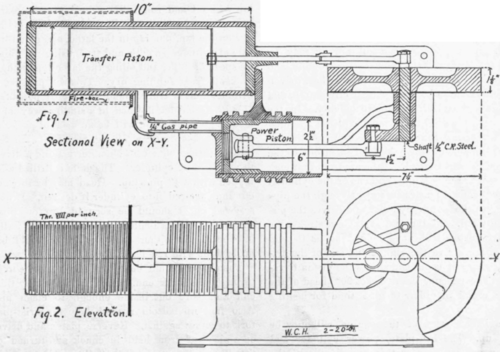 In the drawing the loose fitting transfer piston operated by a connecting rod from a crank-pin on the fly-wheel, is about at the middle of its stroke to the right. This will displace the air from that end, forcing it to the hot, left hand end of the cylinder. As it expands it pushes its ways through the pipe leading to the power cylinder and drives the piston outward. At the end of the out stroke, the transfer piston will have moved so as to send most of the air to the right hand end of the cylinder, where it cools and allows the piston to return. The transfer crank is set 90° ahead of the power crank in order to give time for heating and cooling. The construction of the engine will now be taken up. The bed-plate, power cylinder and bearing pedestal are cast in one piece, with the cylinder cored straight through for convenience in machining. The cylinder has a bracket cast on the back for attaching the heating cylinder. The construction might be somewhat easier if the cylinder were made of tubing, but cast iron is the only really suitable material for such parts. First, file or plane off the feet on bottom of bed plate so that it will stand firm. Then bolt casting to tool carriage of an engine lathe and bore out cylinder with a boring-bar and fly cutter. The last cut should finish as smooth as possible to a diameter of 2 1/2". The ends of cylinder should also be trued up by setting the cutter out and grinding it so that it will cut on both sides. Next locate centre of bearing on a level with centre of cylinder, and drill to 31/64" diameter, and ream to 1/2".Face off ends of bearings to lengths of 1 1/8" with a counterbore in lathe or drill press. To finish cylinder, make a lead lap, by casting a cylinder of lead about 4" long, and 2 5/8" diameter around and near one end of a piece of round iron or steel about 12" in length and provided with suitable centres. Turn lap down to a trifle less than 2 1/2" diameter. Put some fine emery powder on a board, or better, a flat piece of iron. Smear lap with oil and roll in the emery, pressing hard enough to embed emery in the lead. Slip cylinder on the lap, put lap in the lathe, and grind inside of cylinder smooth and true, using the highest speed of lathe, and oiling the lap often enough to keep from running dry. This will produce a cylinder that is truly round and highly polished. If the piston be finished in a similar way and made a good fit, there will be no need of packing rings to keep piston air-tight. The cylinder head is turned off with a shoulder making a drive fit with end of cylinder. The hole is drilled and tapped with a 1/4" pipe tap. Head may be threaded and screwed into cylinder if desired. If not screwed in, it should be secured by four pins driven into holes drilled through cylinder walls into head. In either case the joint should be made tight with red lead. The piston should be cast with a 1" hole cored through the back end. Hold in a chuck by this end and bore out inside enough to clean up. Also face up bottom around hole for wrist-pin fork to screw against. Reverse piston and drive on a piece of iron held in chuck and turned to fit. Turn off outside to 2 1/2" diameter, face off end, bore and thread hole 1 1/4" diameter by 20 threads. The outside of cylinder should be finished very smooth and true with a dead smooth file and emery cloth. It may be left a trifle tight fit for the cylinder and the two ground together with flour emery and oil. The wrist-pin fork, which should he a brass casting, may he held in a four-jaw chuck, the end faced off and shoulder turned down and threaded to fit hole in piston. Also drill a hole in end, taking care not to go through, and tap out 1/4" x 20 threads. Then take out of chuck and screw to an angle-plate, centering by turned base and height of boss, and drill for 5/16." wrist pin. The wrist pin may be made of cold rolled steel cut off to the right length, and secured by drilling and pinning through one boss after connecting rod is in place. The sides of fork may be faced off in lathe by mounting on back of face plate, but in same position as for drilling wrist-pin hole. The connecting rod should be a brass or bronze casting, but it may be made of bar steel 3/8" x 5/8". Lay out centres in bosses at each end 6" apart. Drill with No. 10 drill and tap 1/4" x 20 thread then fasten to face plate by machine screws through slots. The bosses may now be turned off on one side, the rod turned over and faced off on the other side to 3/8" thick, to fit fork. Then enlarge holes to 3/8" and 5/16" respectively for crank-pin and wrist-pin. The balance wheel should be drilled and reamed to 1/2", then mounted on an arbor and the rim turned on edge and both faces; diameter, 7 1/4", face, 1". A wheel suitable for this purpose may often be found in the scrap iron pile at a junk dealer's or taken from some old machine. The exact dimensions are not essential, but it should be fairly heavy and run true. If the builder makes his own patterns, it may be found easier to make a solid webbed wheel rather than one with spokes. Both ends of hub should be turned true while wheel is on arbor. The crank is a small iron casting which should be drilled to 1/2" in the shaft end. The crank pin end may then be drilled and tapped with 5/16" standard thread, just 1 \" from centre of shaft hole. Care should be taken to get the holes parallel. The shaft may be made of cold rolled steel and will need no turning. Crank pin may be turned from the same stock. Balance wheel may be secured to shaft by a set screw, and the crank by a taper pin driven through both. This method of fastening would not do in a gas-engine where there are severe shocks to take care of, but the motion of a caloric engine is very smooth and easy. The heating cylinder and transfer piston may now be taken up. The cylinder is made of a piece of 3" iron pipe 10" long. It should be threaded for four inches on each end. The threading may be done by the steam fitter who supplies the pipe, or it can be done in a lathe by mounting on a rough arbor. A piece of hard wood will do for an arbor, if supplied with iron centres. It should be made with the large part a little shorter than the pipe so that the ends may be trued up and bored out inside for a short distance. The inside of the ends may be threaded so that the heads can be screwed in if desired, but this is not necessary. The back cylinder head is simply turned up, with a shoulder making a drive fit with the end of cylinder, or threaded to fit as the case may be. The front head is the same, except that it has a hole drilled and reamed for 3/16" piston rod. Both heads are cast from one pattern, the central boss on the back head being used as a chuck piece and then cut off. If the heads are not screwed in they should be fastened by drilling and pinning. In either case, the joints are to be made tight with red lead. The transfer piston may be made of 18 or 20 gauge sheet iron seamed together at the joints. This is a tin-smith's job and should be left to him. The heads of piston should be of heavier iron. The piston rod should be secured to the front head, and three strips of sawed brass about 1/16 thick and 3/16" wide, should be riveted along the sides before piston is put together. These are for the piston to slide upon inside cylinder. Diameter of transfer piston is scant 2 7/8". The joints in the piston need not be particularly tight, and one or more small holes should be drilled through the side to prevent air pressure on inside when heated. The piston rod is a piece of cold rolled steel 3/16" diameter and 5 1/4" long, threaded at each end. The outer end is screwed into a small knuckle joint, which may be made of sawed brass. The connecting rod is also made of sawed brass, 1/8" x 5/16" and is 4" from centre to centre of holes. The crank pin for transfer piston is turned up from soft steel, driven into a hole in one spoke of fly wheel, 1 1/2" from centre, and riveted over on back. The outer end may be drilled for a small split pin, and the connecting rod held on by a washer under the pin.